The Best Fishing Kayak Under 500 Dollars - The Top 2019 Choices! Do you have a bit of a budget and really want to get out on a Kayak? It’s cheaper and easier than you’d think. For under $500, you can get out on the water in a beautiful, responsive kayak, and multiseat fishing kayak. There are many durable options available today that can take about anything you dish at them on the water. These kayaks are perfect for fisherman, outdoor enthusiasts, and the occasional weekend warrior. Making the final decision means taking a look at all the benefits of each one and deciding which one suits your style as well as needs the best. Without further ado, here are the answers to the best fishing kayak under 500. 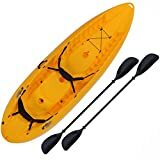 1.2 Our Top Candidates for the Best Fishing Kayak under 500 Dollars. 1.2.1 Perception Sound Sit Inside Kayak (10’5″ model) – Our Top Pick for the Best Fishing Kayak under 500 dollars. Our Top Candidates for the Best Fishing Kayak under 500 Dollars. Perception Sound Sit Inside Kayak (10’5″ model) – Our Top Pick for the Best Fishing Kayak under 500 dollars. The Perception Sound sit inside Kayak is a comfortable, and reliable kayak. Take a close look at the seat as well as the leg room – kayaks as comfortable as this one are hard to find. Plus, this has two places to stow your gear, one small hatch in the front and a larger one in the back, and a cup holder conveniently located. The small in front cabin is perfect for storing things like your phone, wallet, lunch, or a kayak fish finder. With a weight limit of 335 pounds, this kayak will work for most. Reports say it tracks very well in the water, not spinning when you stop paddling. This kayak is made in the USA as well! The warranty that comes with it is a 3 year limited warranty which protects the hull and main frame against defects for three years, while the smaller parts are protected against defects for 1 year. This kayak is stackable, making it a very good option if you own a camp or rental place, or if you need more than one for you and a friend and want to save storage room. The weight is 46 pounds, which is pretty standard for this size – definitely not light but not overly heavy either. Side handles are built into the kayak to make handling it out of the water easier. Experience level required to operate this kayak seems to be just about anyone, as it’s a fairly wide kayak. The reason I personally love this fishing kayak is because it is very stable when you are getting in and out. Whether you are looking for your first kayak or third, the Perception Sound is our option for the best fishing kayak under 500 dollars. The Lifetime Manta Tandem Kayak is the ideal kayak if you are looking to pack two or three people on at a time. While it comes stock with the two backrests, Lifetime does say that it will fit up to three people. With the design of the hull, this seems very feasible. It looks like one of the most stable kayaks available, making this kayak an ideal kayak for a small family or some friends who are planning a trip together. This model is 10 feet long and weighs 60 lbs, so you will want to have a partner to help you out with carrying it ideally. The weight limit is 500 lbs, so that’s something to consider as there will most likely be two or three of you on it. It comes with 2 paddles as shown in the picture. With this size, it won’t be the fastest kayak on the water, but it will be stable and sturdy. If you are looking for a two person kayak, the Manta Tandem kayak is the perfect one for you. It comes with a limited 5 year warranty which basically covers manufacturers defects for that length of time. Because of the comfortable seats, the sturdyness, and its stability, the Lifetime manta is our pick for the best fishing kayak under 500 dollars for 2 people. Responsive and stable, this one-person kayak is playful in the surf but behaves well on flat water. Ocean Kayak's renowned Tri-Form hull combines primary and secondary stability, with a long center keel to keep the paddler going straight. A durable, four-way-adjustable Comfort Plus seat supports all-day paddling, with comfort for any body type. Store gear, food, and other items using the stern tank well with removable bungees and bow deck bungee. Easily carry the Frenzy from boat to launch using the molded-in side handles and bow and stern carrying handles. Similar to the Perception Tribe at a cheaper price, the Ocean Kayak Frenzy is another great starter kayak. This kayak is also wide and stable with plenty of storage space. It is the shortest of all five of these kayaks at only 9 feet long and weighs in at 44 pounds. It can hold up to 325 pounds and is definitely a one person watercraft. In fact, the only negative is that it can be a little snug if you are bigger in either height or weight. It tracks very well and may be a lot easier to handle out of the water due to it’s shortness and weight than most others. Take into consideration how much storage room you have, as this could save you a lot of reorganization. It has side handles that are part of the boat for easy carrying above your head. This doesn’t come with any warranty, but with all the great reviews, that’s nothing too concerning. If you like a warranty or are a little bigger, pass on this one – otherwise, this is a phenomenal choice for a starter kayak. This is the best fishing kayak under 500 dollars that you can sit-on-top. Finally a kayak for the avid fisherman out there! The Sun Dolphin Journey comes fully decked out just for you, with rod holders, gear stowaways, and a comfortable seating area. At 44 pounds and 10 feet long, this kayak isn’t too much to handle by yourself, either. The weight limit is 250 lbs on the Journey, and if you are over 6 feet tall, consider getting the 12 foot version. The kayak has three rod holders – two flush mount and one swivel one. It’s got a paddle holder so you aren’t fumbling around with a paddle on your lap while trying to reel in a fish. It comes with plenty of storage space for gear and tackle with a waterproof compartment on the back. This kayak tracks very well, and though it may not be a top notch fishing kayak, it won’t hit your pocketbook like a top notch one would either. This is also made in the USA! Sun Dolphin has a limited lifetime warranty on any defects for this kayak. 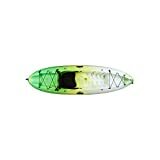 As a fisherman, this kayak is perfect for getting you into those motorless waters or just out on the water for a cheap price. Last but not least on the list for the best fishing kayak under 500 dollars is another sit-in kayak! The Sun Dolphin Aruba SS is a well built, very basic sit-in kayak for those who like to be able to sit inside their kayak. This specific one is 10 feet long and also weighs 44 lbs. It has a little storage compartment for gear behind the seat and that’s about it for storage. Weight rating is at 280 pounds. The back support is fairly high on this kayak, and it is also padded very comfortably. The foot braces on the inside are adjustable depending on your height. This kayak is also made in the USA and comes with Sun Dolphin’s limited lifetime warranty against defects. If you are looking for a very basic kayak for short trips out onto the water, the Aruba SS is perfect for you, especially at this price. It’s one of the cheapest hard sided kayaks I was able to find. This kayak is super versatile and can be passed onto your children as something to use for fun on the lakes. Fishing Kayaks come at all sorts of different weights, prices, lengths, and shapes. This list focuses on those that are under 500 dollars specifically. For under $500, you can get a very solid kayak with plenty of room for you and your gear. Thanks for reading about the best fishing kayak under 500 dollars. If you have any questions about the perfect kayak for you, let us know with a comment below.